"What a week I'm having!" That is actually a quote from an 80's movie I dare you to find! It also applies to this past one and why all I got is one review this week. And not just any review, but a return visit to a spot. Something I don't do an awful lot of. This one came by happenstance. The SO was chatting with some friends and they were all like we should get together for dinner sometime and a few drinks later, I find out we have actual plans to meet them somewhere for dinner. Turns out they had some upcoming reservations at State Bird Provisions and wanted us to join them. The SO only sort of remembered going there which is understandable since it was roughly five years ago. I wasn't there when all this went down and when I was told, I was like, yeah okay, why not. Back when we first hit up the place it was all the rage for the food and experience, though I was underwhelmed to say the least. Interesting dining experience riff on dim sum places? Sure, but I was all that impressed with some of the food offerings we had, kind of why we hadn't been back on our own. I figured it had been awhile since we had been there and it would be interesting to see what had changed, etc. Especially considering people still continue to rave about it and the chefs continue to receive praise and what not from the culinary world. It is prime time Sunday night when we arrive and the place is indeed hopping. Our table is ready so we don't have to wait. The inside seems to have revamped and has more of the standard industrial loft look of so many restaurants in town. Lots of wood and metal. Plus, they have added a wealthy of additional tables and seats at the bar to fit in as many people as possible. The place was moderately sized and bustling before, now it was packed and loud. Welcome to dining in SF. Menu wise I knew it would be different as they change seasonally. The format was still the same however with a small menu of items to order and then roaming trays and carts of small plates of the moment. I kicked things off with the pork belly because, duh, it's me. What better way to see how this whole experience will go down than with a dish I'm all about. Now here is what gets me about this place, nothing is simple in description. Here we have two hunks of pork belly with a spinach leaf or two, a few mint leaves and a couple jalapeno slices. There were also about six other things in here evidently the server spouted off so quickly my mind couldn't really keep up. Plus, it is this small bowl--for $8 in a serving size that amounts to a taster for barely two people, let alone four. How was it? The meat was cooked tender, somewhere between fried and slow-cooked, and there was a good balance of meat and fat in the hunk so you weren't overwhelmed by either. Though, outside of eating one of the jalapenos directly, can't say I tasted all the other things supposedly going on here. Oh, yeah, there was that one piece of citrus at the bottom, guess that constitutes a salad. This seemed interesting. Jerk roasted octopus with roasted yams, cilantro and I think watercress is what they said. It was very loud but this time I mostly sure I got all the elements correct. I'm pretty sure they did a sous vide on the octopus before the roasting as it was not rubbery at all and you could bite through it like a piece of soft meat. It definitely had the jerk spice kick to it, so much so, it was about all you tasted. Those little green leafy things and curly white things didn't do much to add to the plate. There were two small slice of yam here too and the texture on the octopus and yams was the same. They had the same spice and it took me a moment to distinguish between them. It was probably the point. Definitely an interesting dish, though again, $12. You can get a plate of calamari most anywhere in this town as an appetizer for less. I do so love me some beets. Pair it with some goat like cheese and I'm on board. Charge $8 for and I'm like, really? It is hard to mess up beets and cheese and in basic terms, that is what you are getting here. The balsamic adds a nice little tang to go with the creamy cheese and soft beets. Though this really was a one person serving. I know my photo looks big but this was a small bowl I could fit in the palm of my hand. As is, a small tasty bite, but I'm not sure what makes this stand out from other beet salads around town or how this is "inventive". Adding jalapenos doesn't do that, they just took away from the sweetness of the beets with a harsh spice that was unnecessary. We veered off from the "dim sum" things floating around and ordered a couple items off the menu starting with this whole grain fiscalini cheddar cubano pancake. Basically a deconstructed cubano sandwich. Talk about blowing by the $10 sandwiches in this town! They gone and broken it down into it's tiniest elements, literally. The pancake wasn't really a pancake, more like a soft mushy croquette of bread and cheese. Add in two thin slices of ham and a handful of pickled vegetables, a smidgen of mustard and what do you have? A jumbled mess without much flavor trying to pass itself off as a cubano. Underwhelming doesn't really begin to describe this. Maybe the fact all four of us managed to take a small bite and go meh, tells you all you need to know. Hey, why not jump on the toast bandwagon like everyone else! Only one year too late. On the menu brussel sprout toast with bagna cauda sounded interesting. We figured there were four of us so we would get two slices to split. When it came to the table, I actually thought they shorted us but turns out, the above is two servings. It was half of a slice of toast topped with roasted brussel sprouts and shaved cheese. That is half a slice for $8! Say all you want about $4 and $5 toast at other places around town but at least you get the full slice! Now bagna cauda is like an Italian fondue thingy but we didn't get a side of something to dip in so I'm guessing either the bread was coated with it or the sprouts were, I wasn't sure. The bread, while not the thickest slice, was toasted and seemed to taste like it was buttered so I'm putting my money on that. Or possibly this was another interpretation of something like the "cubano" since "bagna cuada" was in quotes on the menu. Either way it tasted exactly like what it was, bread, sprouts and some shredded white cheese without much flavor. 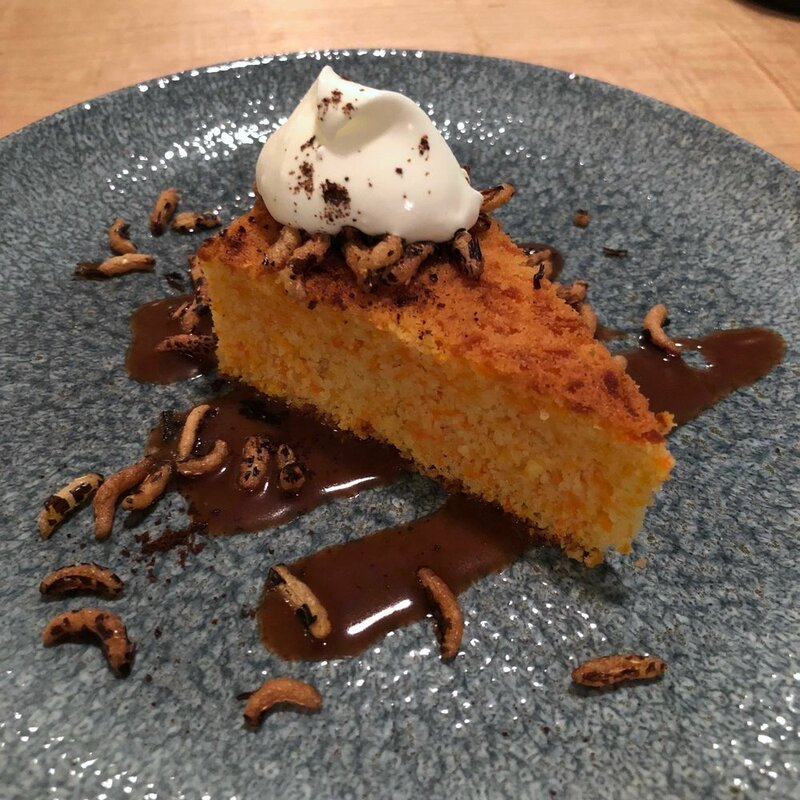 A small part of me still held out hope for dessert, thus the reason we ordered the carrot almond cake with milk chocolate caramel sauce and puffed wild rice. I will tell you up front I hated this dish. The cake was on the dry side and didn't taste of carrot or almond. The chocolate caramel wasn't really sweet or flavorful. We had a hard time tasting either chocolate or caramel. The puffed rice just tasted like burnt rice puffs and the fresh creme on top wasn't sweet or flavorful either. It was like a dollop of air. If ever a "dessert" misrepresented themselves, this was it. One bland non-sweet bite after the next. It was mercifully a small portion and after my couple bites I pushed it away for anyone else to finish. Which no one did completely. Sometimes you get a second chance to make a first impression, and in this instance, I was as underwhelmed (maybe even more so) as I was the first time we ate here. Honestly, I just don't know what the fascination is with this place. Each time I have found tastes lacking or uninspired. When you combine that with small portions and large prices, it all comes out to a why am here situation. Now I know every place can't please everyone so I'm just gonna chalk State Bird Provisions up to one of those places for me. In my mind, it just doesn't meet all the hype it gets and the expectations I seem to have when I go. Though this time around they were low and kind of lived up (or down) to it. If you love this place then great, have at it. I still think they are highly overrated and I would rather go elsewhere. Like their sister spot The Progress, which can also be hit or miss, but more hit. I've heard third times the charm, as far as State Bird goes, I'm gonna skip the third and fourth and fifth and so on.